Positive renewal rates for overall portfolio: +1.1% and +3.5% blended rental reversions for Singapore and Australia portfolios, respectively. QoQ higher occupancy for Singapore portfolio: Higher occupancies at 50 Kallang Avenue (completed asset enhancement initiative for single-tenant), 40 Penjuru Lane and Pioneer Hub. Backfilling of space came about from new tenants and existing tenant expansion. 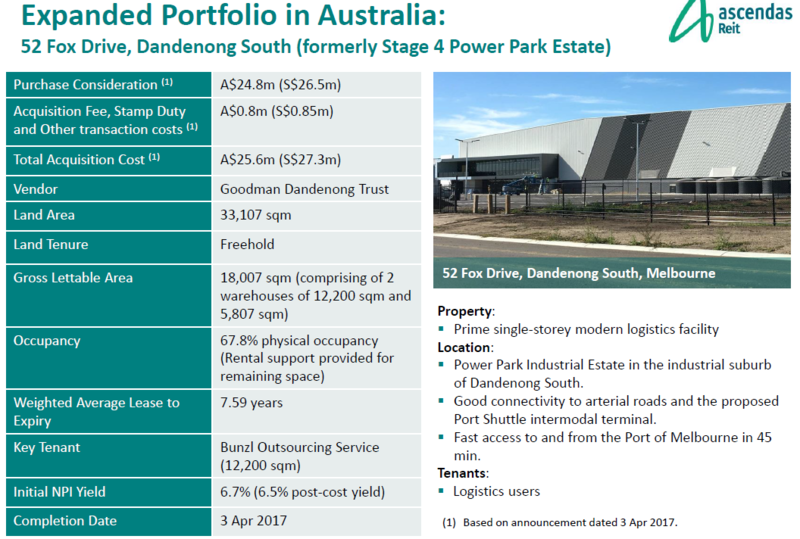 New leases lifted Australia portfolio occupancy: Both 62 Stradbroke Street and 494 Great East Highway are now fully occupied, previously 41.7% and 58.5% occupied, respectively. Total portfolio WALE remains stable at 4.3 years: A blend of 5.5 years for Australia and 4.2 years for Singapore. Negative reversions for certain segments of the Singapore portfolio: Hi-Specs Industrial -0.7%, Light Industrial -4.0% and Logistics & Distribution Centres -2.0%. The outlook is stable. There are no leases expiring in Australia for the remainder of the year. 13.3% of Singapore leases by gross revenue expiring in the remainder of the year. 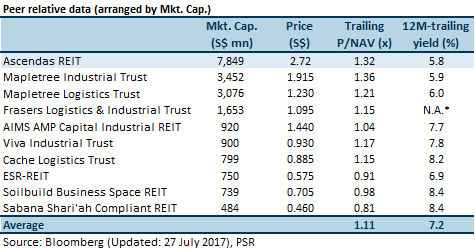 Some negative reversions are to be expected from the Singapore portfolio, but offset by the portfolio rebalancing strategy. We expect recent acquisitions to drive gross rental growth in FY18e. There will not be any further unit dilution from the Exchangeable Collateralised Securities (ECS) as it has been fully converted in FY17. Ascendas REIT (A-REIT) has a healthy aggregate leverage of 33.9%, allowing it to embark on further acquisitions. We expect a stable 5.8% yield and our target price gives an implied FY18e P/NAV multiple of 1.35x, which compares against the FTSE REIT Index forward 12-months P/NAV multiple of 1.06x. 50 Kallang was decommissioned to facilitate the asset enhancement initiative (AEI) for a single-tenant. The AEI was completed during the quarter and handed over to the tenant. 52 Fox Drive was acquired during the quarter and contributed to the growth in gross revenue.